hey! Great job on the retroflag script for shutting down the pi safely! 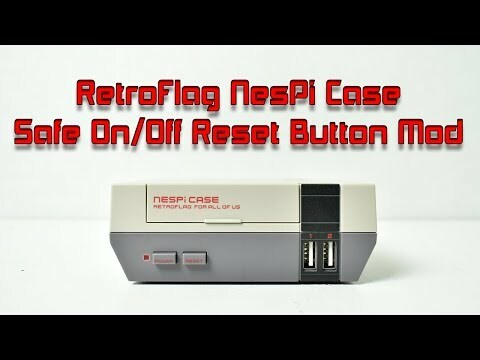 I did notice that the script will ONLY work in the retroflag NESPI case. If i take the SD card out and put it in another pi, it starts to go through the startup sequence and shut itself down before it even reaches the intro video. When I reinsert it into the PI in the NESPI case, it works as you intended it to. Wondering if there is an easy way to disable the script if I wanted to use the SD card in another PI without the mod? Fixed without re-doing the whole machine. I’ll bet a Linux LiveCD will suffice as well so having a whole Linux machine wouldn’t be needed. If you absolutely must swap your SD card seamlessly between different Pis, use pin 7 on the GPIO port instead of pin 5 for your reset switch. First, edit the shutdown script (/home/pi/scripts/shutdown.py) and change all references to pin 5 to pin 7. The following two lines are the ones that need to be changed. Just replace 5 with 7. Next, physically move the reset wire from GPIO pin 5 to pin 7. Now, your system should behave properly. It will safely shut down when you press reset in the modified retroflag case, but it won’t automatically shut down if it is running outside a retroflag case. The reason why pin 7 behaves better than pin 5 is because pin 5 is hard wired to a pull up resistor. Without the 150 ohm resistor from the nespi mod pulling it to a low state, pin 5 automatically remains in a high state, which triggers the shutdown script. Pin 7, on the other hand, is not hardwired to a pullup resistor. Because of this, the script can initialize it in a low state, and it won’t automatically be in a high state when it is used outside of a modified nespi case. Matt, that can happen if you leave the pin floating, as it will randomly be floating between 1 and 0. — If you want to use it with no button hooked up, then you should add a jumper (like an old harddrive one) from GPIO3 to ground (third row from the top should do it). Thank you Chuck for your cool solution. Did someone tried it out? Consider that Pin 7 GPCLK0 can also be used to to output a 1MHz+ clock signal. Is Pin 7 the only Pin that can be used? Thank you for your answer. I’m getting this error. (6) Could not resolve host: pie.8bit.junkie . Is this file not hosted by 8bit anymore? it’s a pipe “|” not a lowercase letter “L”. How do you undo the shutdown script so I can put my pi in a different case. Any help would be greatly appreciated. Did this work? I need to remove the script from mine as well. I installed following the instructions on a Stretch implementation on my rpi. I get exactly the same problems as reported earlier. The button works after the install, but after a reboot it does nothing. Restarting works of course. Should I be changing the installation someway, because I note that the problem claims to have been fixed? OK, thanks for letting me know. I’ll have to try it and see what might be happening. Also have the same problem… Can someone provide a workaround?? Holy crap I was going bonkers. Atleast its just not me. I am going to go back to 4.3 for now and probably just order the new NESPi+ case. Hey, very new to this but I haven’t seen anyone else with this issue yet. I did this mod on my case and ran the script for adding the safe shutdown. All seems to go well and it says it is installed, then auto shuts down? When I boot back up, the button does nothing. In the instructions he tells you to reboot, but it doesn’t automatically do it for him. Not sure if I’m doing something wrong or if the program has been updated since the video was made. In any case, neither shutdown or boot up works with my reset button. I just don’t know if it’s my modifications or the code since I couldn’t check line by line before it shut itself off. I had the same symptoms, and believe I have a fix. The fix was to edit /etc/rc.local, and launch the script from there, appending the line with the ampersand character so that it runs in the background, and does not halt the boot process. I don’t know if the sudo part is necessary or not, but this worked for me. Also, I don’t know why I now seem to have two separate “shutdown.py” processes running…. so I’m investigating that quirk, but the reset button now safely shuts down my RetroPie box! Tap it again, and it boots up. My setup is a nespi case+ and retropi rev b pcb with the 4.4.4 software. I had a night mare of time installing the github software, so I looked for an alternative to get this case working and I came across this youtube video. It also has a on/off switch installed. Additionally when I try to power up this board, it turns on briefly then shuts down so I cant remove this script. I did modify it a little so executing the script is silent and errors are loged. Tried Chuck’s solution , to change Gpio 5 to Gpio 7 ..
this does work for shutdown , but it will not restart the pi again by pressing the reset button again after shutdown.